First of all, holy crap, I have so many different posts going on at the same time. I think I have enough content for 2 weeks, which gives me a short breather. I've got a few fun things with end of year and beginning of year stuff as well as some retro reviews ;) Anyhow! It's sort of funny. I think I've seen at least a dozen different football movies and I don't think there's one that I didn't enjoy. I say it's funny because I'm not a football fan at all and in fact, I hardly know how the game is played (catch the ball, don't trip, run to the other end?). So I went into this thinking that it was going to be a football movie (see picture on left), but was surprised to find out that it was more of a human story with hardly any football in it at all. 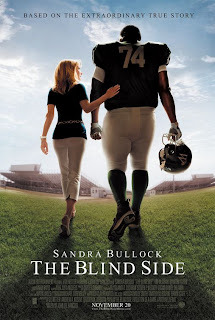 The Blind Side is the true story of a young man named Michael Oher, who both lived in and out of foster homes and was also homeless. Seeing his athletic prowess, a coach at a private Christian high school convinces the school board to accept him as a student. Still homeless and dejected, he feels left out in the "white walls" of his school. One night, Leigh Anne Tuohy and her husband, catch a glimpse of Oher walking out alone in the freezing rain, and invite him to stay at their home and its here that he begins to open up and make a recovery. What makes the movie is the contrasting lifestyles of the Tuohy's and Oher. The Tuohy's, I believe are millionaires or at least close to it, while Oher has lived in poverty his entire life. It's a pretty powerful decision for the who Tuohy's take him in under their wing, help him get back on his feet and eventually become his legal guardians. I've pretty much talked about the full premise of the movie and I haven't even mentioned the word football once in the plot. Football does become a plot point, but it is secondary to the core of the story told here. The most remarkable thing about the movie is that the whole thing is a true story. SPOILER: at the end of the movie during the credits, it cuts to real clips of Oher getting drafted in the 2009 NFL draft to the Baltimore Ravens. We also see a montage of photos of the real Oher and the Tuohy family together. It's pretty crazy because all this happened pretty recently. Six years ago, he was living on the streets with not a dime to his name, and now he's signed a near $14 million dollar contract to play football. It's just amazing how this all changed because one or two people saw something good in him and raised him with real love, something he was lacking his whole life. My only complaints with the movie are really minor in the grand scheme of things. I really didn't like the score by Carter Burwell. And its a shame because he's done fine work in the past, but the score just didn't seem to match the movie. The music it what helps reinforce, if not create, the atmosphere, and there are some parts where I just felt the music would have been better off in a sitcom than a movie like this. The second thing is Sandra Bullock. I had trepidations about this movie because of her involvement. I mean look at her repertoire of films. She plays the same character all the time. In fact, she basically reprised her role as Miss Congeniality with this movie. Who walks into the ghettos in a tight little summer dress? BUT, I do forgive her and will let it pass in this movie only because at the end of the movie when it showed photos of the real Leigh Anne Tuohy, Bullock looked exactly like her and so I guess the real Ms. Tuohy is like a real life Miss Congeniality. I firmly believe that the real Ms. Tuohy walked into the ghetto with said dress. This is the second time that Tim McGraw has played a football dad. The first time was in Friday Night Lights which he was pretty damn awesome in, but this time around, he could have been interchanged with any ol' actor. He did nothing special with what he was given, but his role was underplayed as well. This is safe recommendation and its a good movie to watch for the whole family. The story is wholesome, touching and it does make you think a bit. The fact that it's a true story is a great triumph in human kindness. Til next time, later geeks!